Have you ever measured yourself on Klout? I get this a lot from senior marketers and communication folks. They want to know how experienced the staff is at using social media tools. It’s tough for senior staff to gauge this because they don’t use social media as much as the younger staff. So they just have to trust the staff when they say they know how to use it. But do they really know how to use it? I built this questionnaire after running into an issue with a communications person (previous job a long time ago) who swore they were experienced at using Facebook. They were adamant that they knew exactly what they were doing and didn’t need any training. So I set up a Facebook page and gave them access to the admin. “I can’t post anymore because I want to keep this post at the top of our page.” – This was before Facebook had pinned posts. Needless to say, that was when I really checked out the new admin’s profile. She had less than 30 friends, she was very active but didn’t even understand how to write on another person’s wall to wish them a happy birthday. So that was when I decided I’m done “trusting” people when they say they understand how to use social media. Now I make sure to visit their digital profiles and read their posts. I created these social media survey questions for employees. I would ask these questions in order to determine how strong an employee is at using social media and if they have any influence in the social media realm. Now these are just base questions for generic social media. While some people may be very good and deep on one platform, they may not use or understand how another platform works. If that is the case, then I would not consider them to be at an advanced level. I use these questions to also help with social media training – to see what level people are at so I can base the training by their needs. I normally drop the questions into a survey using surveymonkey.com and go through the results – one by one. 1. How comfortable are you using social media for personal use? If they answer with “Not comfortable” or “Very uncomfortable”, I recommend that they don’t take the class. If their position requires it, (they are in communications or marketing) then they may want to think of a new career path because this social media stuff isn’t going away and if anything is becoming the way we all communicate both internal and external. 2. How comfortable would you be using social media for a business? Any answer here is fine. You can teach people who are on the “uncomfortable” side of the equation as long as they are willing to learn (see question one). It just may take them longer. But you also need to be careful of the “very comfortable” people, because they may think they know everything and set in their ways. 3. Which social networks are you on? – All 16 – whoa. – 10-16 – they get it. – 5-10 – much better than the average bear. – 2-5 – they probably have the standard networks. – Less than two – they are probably uncomfortable about the digital lifestyle. 4. If you have Facebook, how many friends do you have? The average person has about 200 or so friends on Facebook. And recently I’ve noticed many people have been deleting “friends” that were just acquaintances (instead of using friend’s lists). I would say the more savvy people have between 500-1000 friends. 5. If you have Facebook, how often do you visit the site or mobile application? A couple of times a week or less is a pattern of someone who is not really engaged in social media. They can be trained and right now just don’t get the benefit of using social media for business. 6. If you have Facebook, how often do you post, share, comment or like? Again, less than once a day shows lack of engagement and that’s fine. More training will help move it along. 7. If you have Linkedin, how many connections do you have? Most professionals still don’t understand the strength of a highly networked Linkedin profile so less than 400 is pretty normal. More training about the reasons to use it is needed but once they get it, they can usually add people quickly. 8. If you have Linkedin, how often do you update your profile/resume? 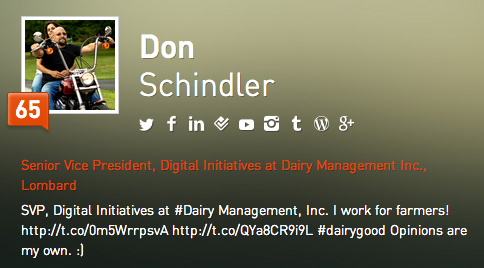 Updating your profile once a month is someone that really gets the benefits of Linkedin. Most people are not like this. The answer “I don’t remember the last time I visited” means I’m going to have to work harder to convince them of the benefits – and see if it matches to the “uncomfortable” position from the first survey question. 9. If you have Twitter, how often do you visit the site or a mobile application for Twitter? Twitter really requires you to be engaged at a high level to get the most out of it so anything less shows me that they are beginners. 10. If you have Twitter, how often do you tweet? 11. Are you a blogger? I have a blog but I haven’t posted to it in a while. If you answered yes, then please put in your website URL. If you ask someone if they are a blogger and they say “yes” then I’m pretty certain they blog. Most bloggers are happy to let you know they blog and will give you their URL at the drop of a hat. That’s a good thing. 12. Have you read the social media policy that your company has in place? Do you understand what it says? I did but I don’t remember the specifics. This just lets me know if they even know about their being a social media policy with the company. Part of training should be going over the current social media policy. If you don’t want to ask any questions, you can just level your employees yourself if you have access to their profiles. With each person in training, check their digital profile or footprint for the following stats. Beginners might be on the network a lot but if you haven’t built a large network then you are probably not using it like an Intermediate and definitely not like a professional. Intermediates are usually pretty social savvy but aren’t fully engaged all the time in social media. They are off and on the networks and don’t need a lot of assistance in setting up profiles or pages. They need more help when it comes to managing their professional brand and how to link the networks together. I would also use other tools like Klout and Peerindex to see if where they fall on the influence scale. So what questions do you ask your staff when it comes to understanding how well they know social media and how they use it? 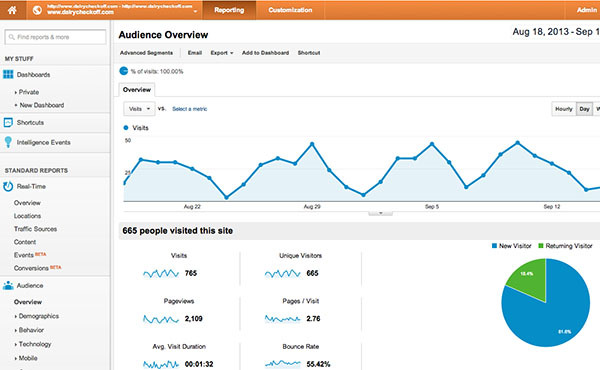 How should you set up your Google Analytics dashboard for your farm website or blog? 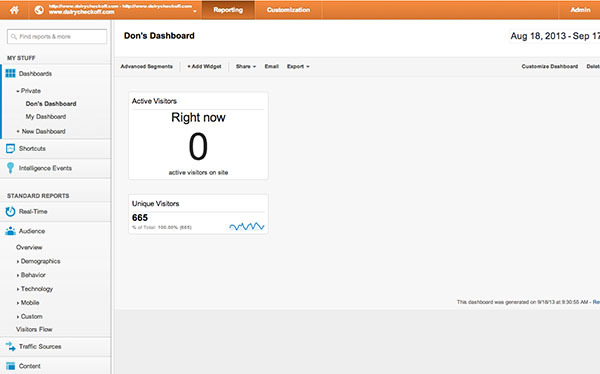 How do you get a snapshot Google dashboard? I’ve been following Christopher S. Penn for years and am a big advocate for listening to his weekly podcast with John Wall called Marketing Over Coffee. I learned how to set up a custom dashboard in Google from Chris so some of this custom dashboard set-up comes from him, a few others and my own added info. 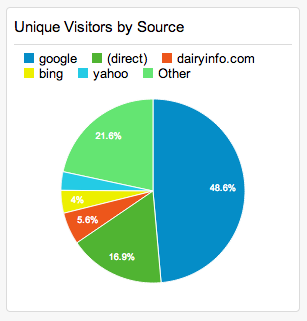 So props to Christopher for showing me how to do this so I can show you how to set up your dairy website/blog analytics? 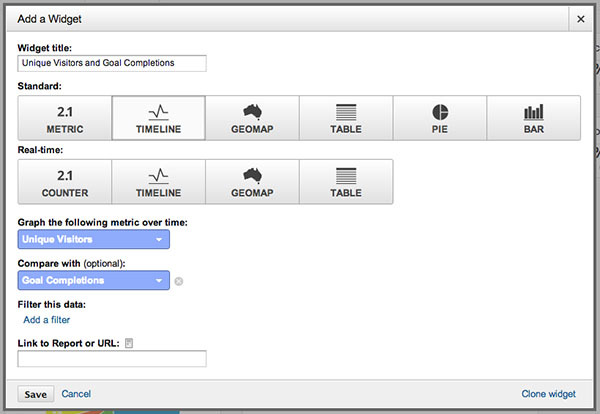 Before you set up your Google Analytics dashboard, you really need to determine the goals of your website. If you need help with setting up Goals and Conversions, then check out my post on Setting Goals. 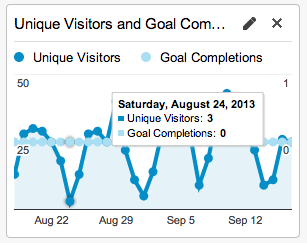 If you’ve never set up analytics on your website/blog, you’ll need to do that first. 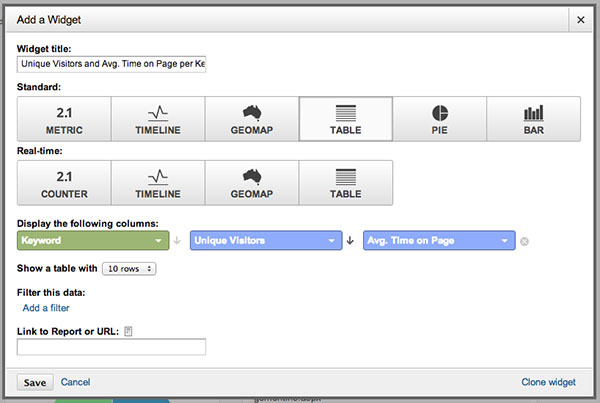 You can learn how to do that from Google with their setting up Google Analytics on your website post. 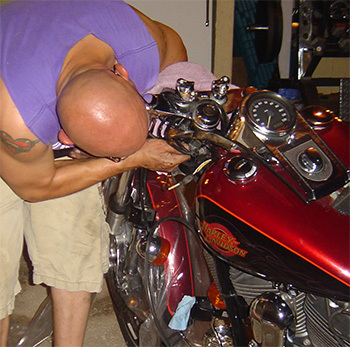 To build a custom dashboard, it’s fairly easily. But why would you want to, you know, since Google already provides large tabs with the analytics on them. Mainly because you probably don’t have a lot of time to be digging through all those analytics. Your own dashboard will help you get right to the meat of your needs. You might not have to select a profile if you only have one website. If you are already on the Audience Overview, just skip to Step 3. This will be on the top left navigation. 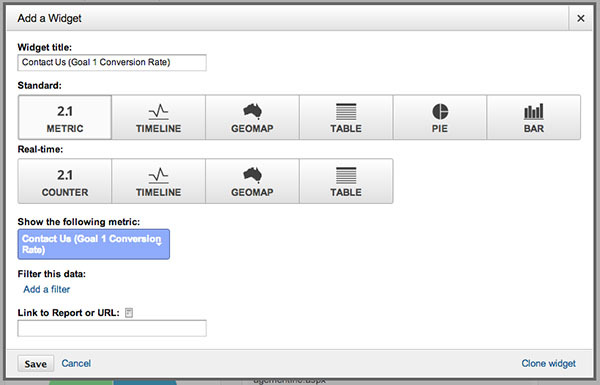 You can create up to 20 custom dashboards. 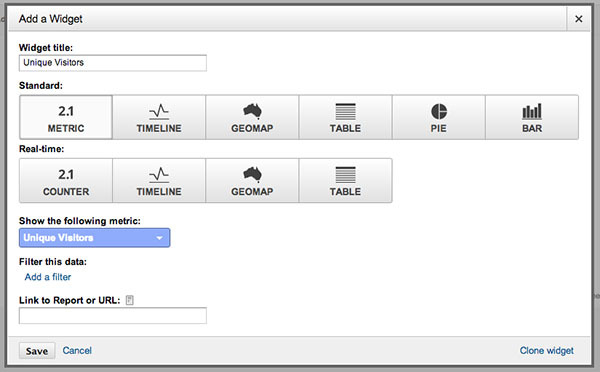 You’ll be able to create and move all the widgets you create so the dashboard will look exactly as you want it to look. Once you click, add a widget you’ll get a pop-up on the page that will help you define each and every widget you want to create. First you’ll need to fill out the Widget’s name. Metrics – just a simple figure or calculation. Timeline – a visual timeline with metrics. Geomap – a visual map color coded for the metrics. Table – several metrics tied together in a table format. Pie – a visual pie chart of the metrics. Bar – a bar chart of the metrics. If you select Standard, these metrics will be tied to the time slot you select on the top right. If you select Real-Time, these metrics will be tied to only real time data and will constantly be changing depending on the real time traffic to the website. 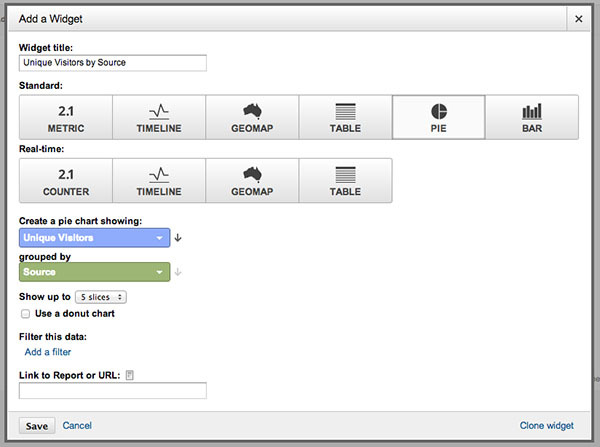 Once you select the visual, the “show the following metric:” will change depending on the visual. 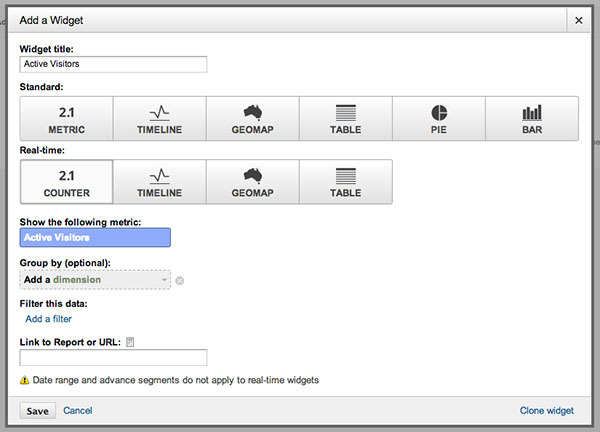 The last option, “Link to Report or URL” gives you the possibility to link directly to a standard Google Analytics report or a URL within the widget. Then you would click “Save”. 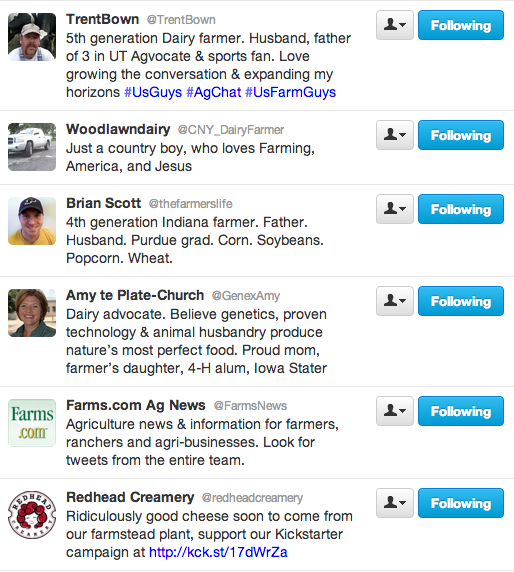 Here are the following widgets I would set up for dairy industry or farming website. These will make it easier on you to see at a snapshot what is going on. 6. 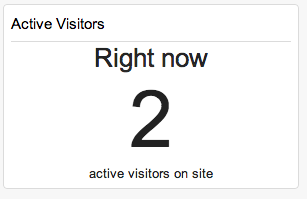 Real Time Active Visitors – how many people are on the website right now. The above image is what the widget should look like. The above image is what the widget should look like. As you probably noticed, this widget is then on top of the first widget you created. You can drag this widget down under the other widget by simply grabbing the top bar of the widget. Name the widget “Unique Visitors and Content Pages by Contact Us” if that is your goal. 10. Unique Visitors and Average Time on Page per Keyword – this will show you how many unique visitors used what keyword to get to your website and how long they stayed on the page. What does “not set” mean? Well, it’s kinda confusing but Google tries to clear it up with their explanation. To me, it’s tough to tell but basically Google is missing the dimensions it needs to determine the keyword. What does “not provided” mean? This means that the user was logged into Google and was securing using search so the keywords are not passed along to Google Analytics. 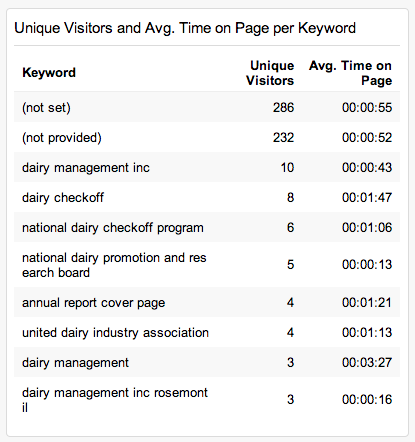 This is for privacy but you can “unlock” these keywords through these steps by KISSmetrics. Name the widget “Unique Visitors and Avg. 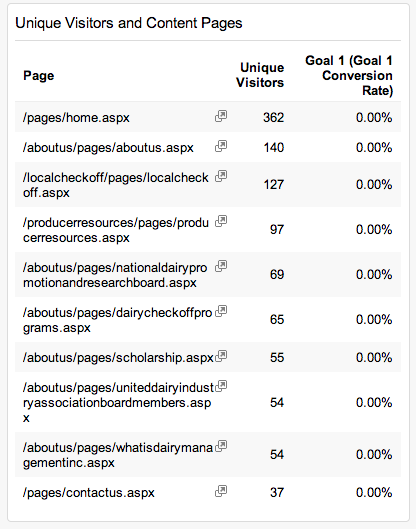 Time on Page per Keyword” if that is your goal. 11. Contact Us (Goal 1 Conversion Rate) – this will show you how many times your goal converted. 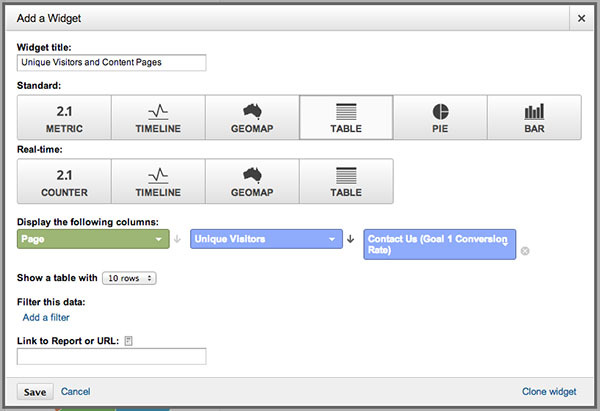 Name the widget “Contact Us (Goal 1 Conversion Rate)” if that is your goal. 12. 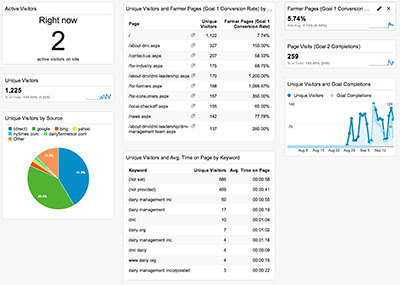 3 min or more (Goal 2 Conversion Rate) – this will show you how many times a unique visitor stayed on the site for 3 minutes or more. Name the widget “3 min or more (Goal 2 Conversion Rate) ” if that is your goal. 13. Unique Visitors and Goal Completions – this will show in timeline form the number of unique visitors and how many times there was a goal completion. Name the widget ” Unique Visitors and Goal Completions”. There you go – eight different graphs to quickly view how your website is doing on your own personal dashboard. And of course, if these don’t meet your needs you can add many more widgets customized to your specifications. In a future post, I’ll go over the main sections of Google Analytics that are important to dive into as well like Content – All Pages and Landing Pages. And I’ll also look into custom reports – there are many good ones out there that other people have created – and how to add them as well. If you have any questions, or want to add your own, just let me know by leaving comments below or contact me via your favorite social net. All my connections are on the right. 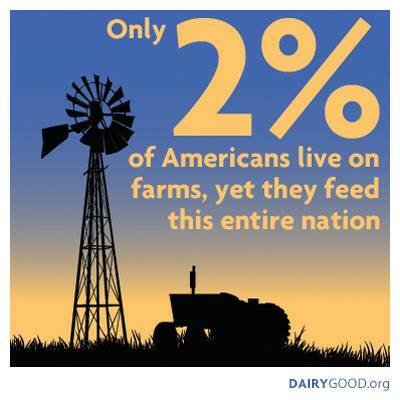 What does the other 98% think about farming? So if you know that most of today’s U.S. population is disconnected from farming, then giving them an inside view is important. 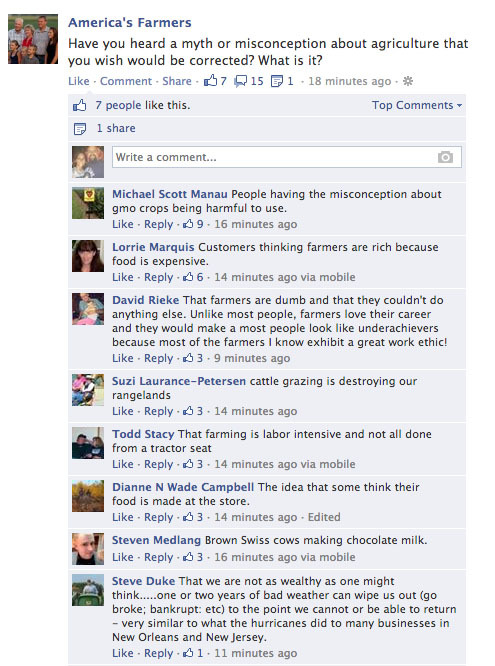 Notice, I didn’t say “educate” them on farming – it’s not what they want and definitely not how they want to hear it. 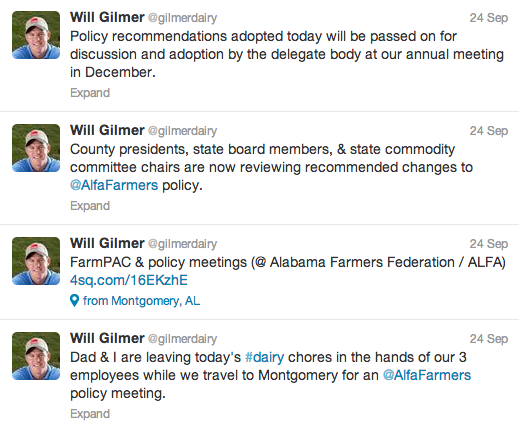 They want to be insiders on how farming works and they want to know farmers (farmers are still one of the most respected industries in the nation – check out the latest Gallup Poll) so they can ask questions directly. When you look at it from their point of view, what do you think they would like to know? How cows are milked? How hay is cut? What do dairy cows eat? Where do they sleep? How long after the milk leaves the farm does it take to get to my house? Are dairy cows treated well? You can answer these types of questions easily. But instead of just answering, think of showing them and telling them a story around the answer. If you’ve got your smartphone with you, then think of how you would answer questions on farm life using photos and videos. Photos are half of all posts on Facebook and are the top shared posts. 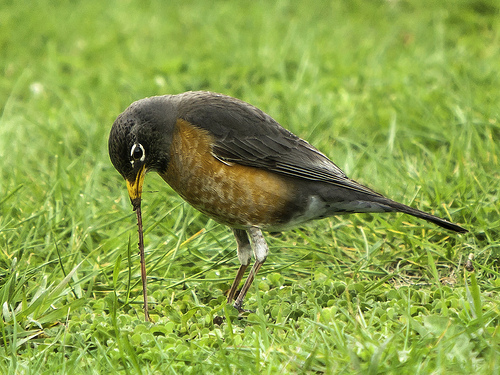 If you want your status update to be shared a lot, your best shot is with a photo. 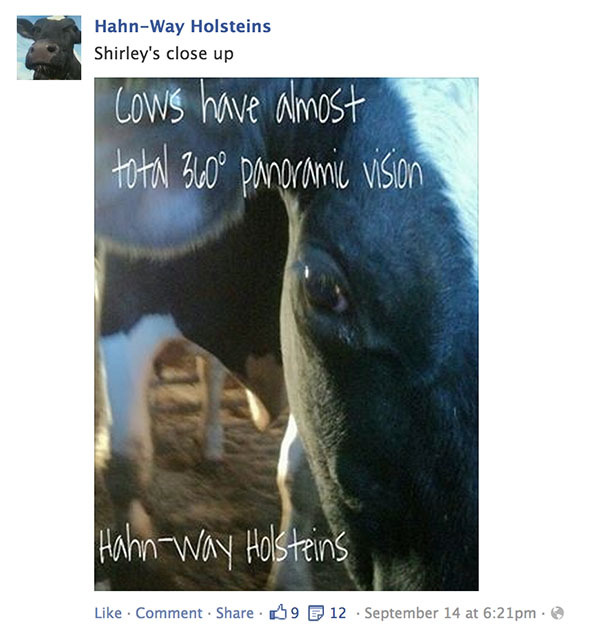 Table Rock Farm and Hahn-Way Holsteins does a great job of showcasing a photo with insider information. Top Tip – use a photo program like picmonkey.com or Over app for your phone to put text or your farm’s logo on the picture. This keeps it from being misused or stolen and it helps your brand. Videos are the next best thing to a photo and you can get more of the story of what you are doing. The only problem with video is that it takes more effort from the user to actually get the story. YouTube is the most shared website on Facebook so if you can put together a short video (2 min) then you’ve got a good shot at getting your message across. 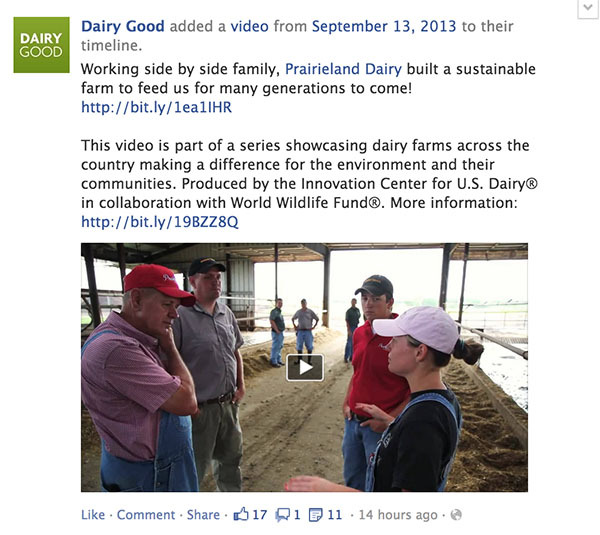 Dairygood posted several videos on sustainability and dairy farming. If you ever want to know what people are searching for answers, simply use the Facebook search or a Google search and read the autocompletes. 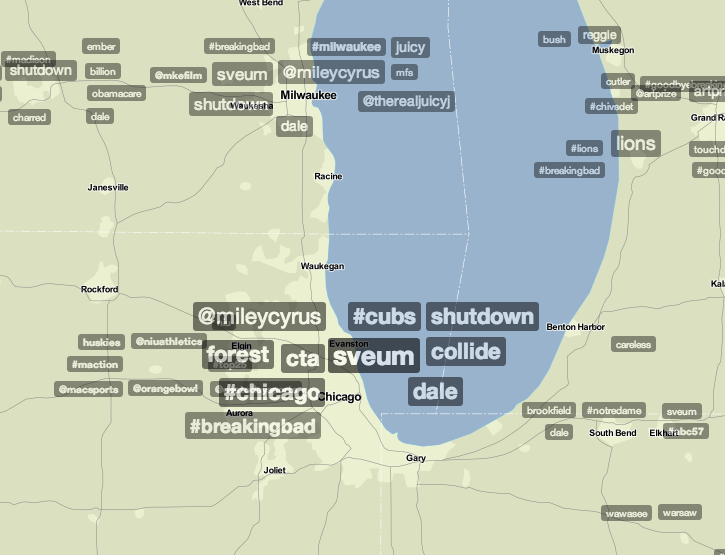 These are the top searches in your region. Type in your search and see what Google displays for you – make sure you log out of Google. You can ask people to help name calves, give them insight into how does modern farm equipment works, or just let them know what happened today on the farm. 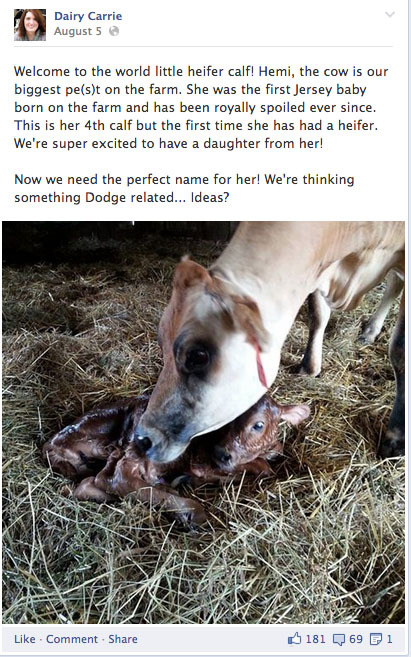 This post by Dairy Carrie does a great job at getting people involved with naming a calf and showing how calves look when they are born. 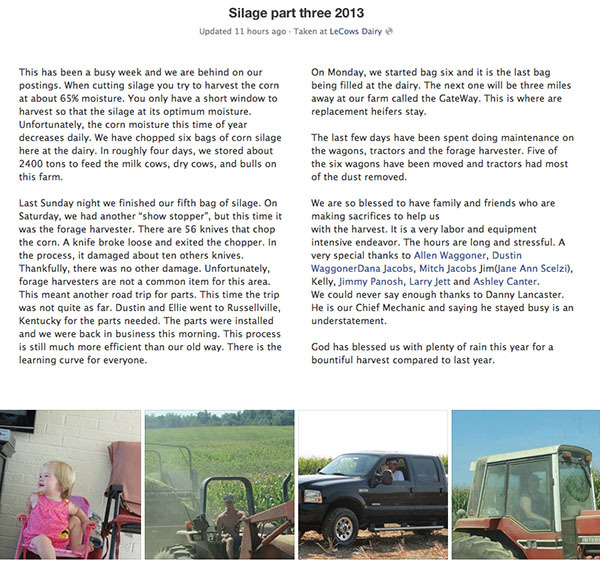 LeCows Dairy gives insight into silage, what it is and why they use it along with photos to engage people. This takes time but the engagement is high and people love it. The Farmer’s Life also gets a question in this picture asking about what these tractors are used for. It’s a great way to answer a question and engage someone not familiar with farming. 6. Ask them what they want to know. Sometimes all you have to do is ask and people will let you know what they want to know. Now you will always have people that will be distractors. The main thing here is to engage when people really want to know vs. people just trying to get you to fight. If that happens, you can check out this post on arguments and what to do. 7. 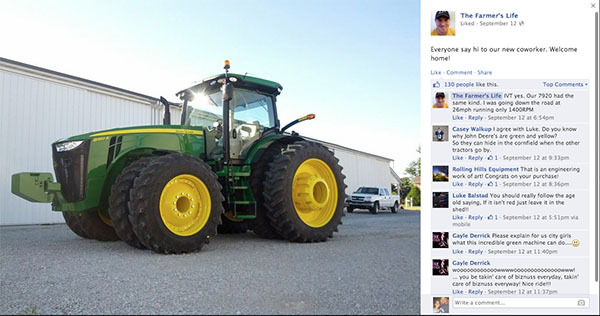 Share the best photos, videos, status updates from other farm pages. 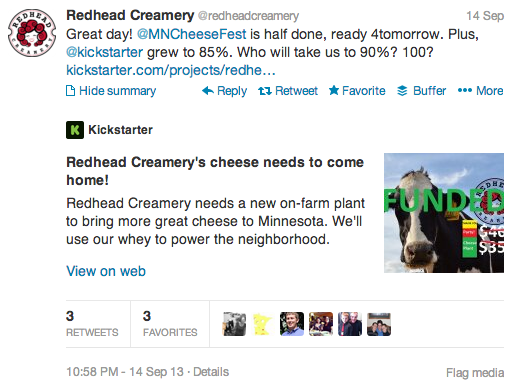 When Redhead Creamery started its kickstarter campaign, they needed help from everyone – including other farm pages to spread the word. 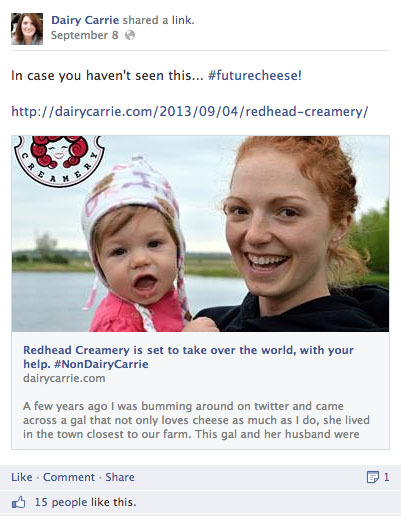 Dairy Carrie stepped up to help and got the word out. I’m sure Redhead Creamery will return the favor. This should be the Golden Rule for all farmers on facebook. Help spread the word and it will come back to you. 8. Treat other pages like your page – post comments and share on their walls. 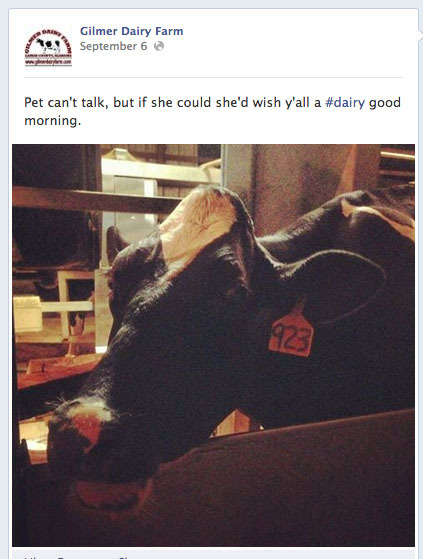 When Al Roker of the Today Show visited the Hatcher Family Dairy, DairyGood tagged them in the post to let them know that they were talking about them on Facebook. This also encourages the other pages to comment, like or share the post. Tagging other pages lets them know that you are talking about them. It’s hard to argue when you are getting information directly from the source. If you can post more than that, it’s ok. Just don’t go too crazy. 10. When you share on your page, make sure to share on your profile as well. So should be a no-brainer, but many people fail to do it. You can easily switch to your page and then back to your profile via the desktop version of facebook. With the Facebook Page Application, you can do it on your phone as well. Ray Prock of Ray-Lin Dairy is very good at pushing his blog posts through Twitter, his Facebook Page and his personal Facebook profile right after a post. 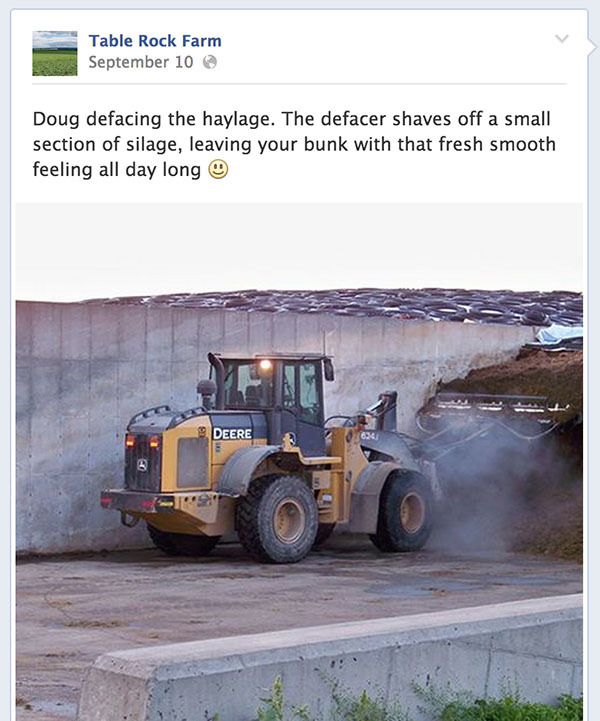 So what are your best practices for posting on your family farm page? I would love to add them here.